I came up with the idea of matching scarves because hubby and I love to wear matching shirts when we take day trips or vacations, but don’t really have anything matching for the colder, winter months. Our styles are different enough that I didn’t want to just make 2 scarves with the same colors and stitch pattern, so I came up with the idea of making a triangle shaped scarf or shawlette design for me, and a more traditional scarf for him. Gauge: 15 dc = 4″; specific gauge is not significant in this design. 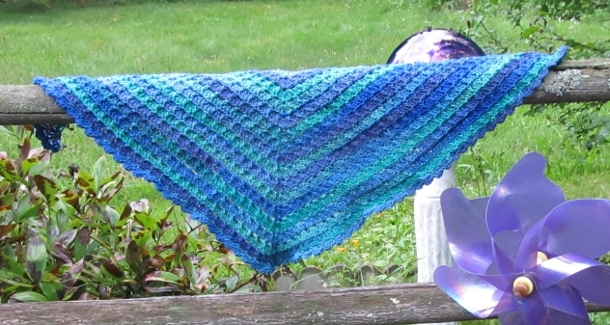 Note: Her scarf is a top down shawl design that can be worked in any weight or in any gauge of yarn. Slanted Cluster: YO, insert hook into ch-2 sp, YO & pull through, YO & pull through two loops on hook (two loops on hook), YO, insert hook into same ch-2 sp, YO & pull through, YO & pull through two loops (three loops on hook), insert hook into same ch 2 sp, YO & pull through, YO & pull through all 4 loops on hook, slip stitch into next sc to complete. Row 1: Ch 2, turn. Make 3 sc in 2nd ch from hook. Row 4: Ch 1, turn. (Sc, ch 2, sc) in 1st dc, (ch 2, sk next 2 dc, sc in next FPdc) twice. Ch 2, sk next 2 dc, (sc, ch 2, sc) in between last skipped dc & next dc. (Ch 2, sk next 2 dc, sc in next FPdc) twice, ch 2, sk next 2 dc, (sc, ch 2, sc) in last dc. Row 6: Ch 1, turn. (Sc, ch 2, sc) in 1st sc, * ch 2, sk 2 dc, sc in next FPdc. Rep from * across until marker, (sc, ch 2, sc) in marked sp, bring marker up into ch-2 sp just made. * Ch 2, sk 2 dc, sc in next FPdc. Rep from * across until last dc, (sc, ch 2, sc) in last dc. Row 7: Ch 3, turn. * Make 2 dc in next ch-2 sp, FPdc in next sc. Rep from * across until marker, make 4 dc in marked ch-2 sp, bring marker up in between 2nd & 3rd dc. ** FPdc in next sc, make 2 dc in ch-2 sp, rep from ** across row, dc in last sc. Rep rows 6 & 7 as many times as desired, then repeat row 6 once more, removing stitch marker. Row 1: Ch 3, turn. Slanted cluster, * ch 3, slanted cluster. Repeat from * across row. End off. Weave in ends. Block lightly, & wear with pride! 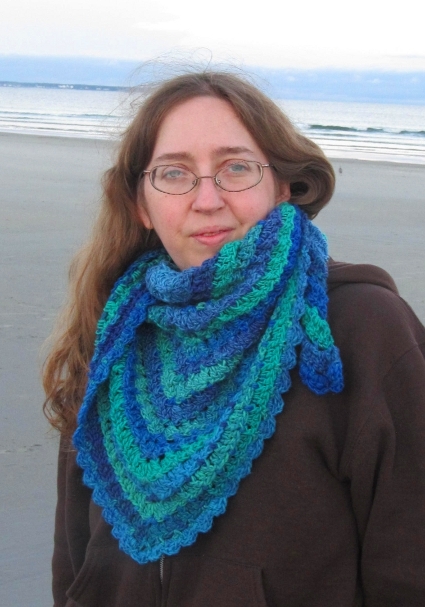 Anastacia Zittel loves to crochet, knit, dye yarn, & do a little spinning & embroidery from time to time. She also loves to read fantasy & historical fiction. 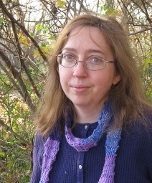 She enjoys writing about her crafty adventures at Anastacia Knits. She’s been designing seriously since summer, 2010. To see more of her designs visit her shop, and stop by her group for support, CALs, inspiration, and more! Pattern & images © Anastacia E. Zittel. All rights reserved. Really beautiful. Did you use Bernat Mosaic Spectrum? I love the colors and would like to duplicate the look for my sister. I really like the color pattern formed in the design. Will definitely make this scarf. FPdc means ‘front post double crochet.’ This tutorial may help you with it.